I purchased a 735 planer 2 weeks ago. I hooked up a 4 inch hose to my dust collector. After the hose fell off the blast gate and painted my wall with chips and dust, decided to purchase a 50 gallon heavy plastic trash can with lid, fittings etc. Plan is to go straight into the can from the planer with as short of hose as possible. 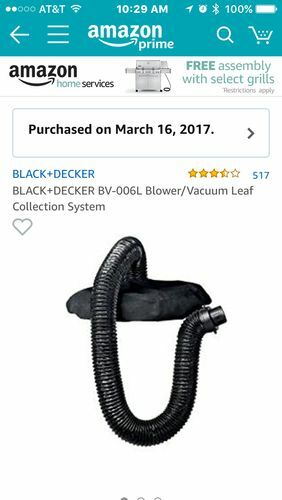 I am putting it together today but I am just wondering if I need to also install a screened vent hole of some sort for air to escape? Will it create a vacuum? You need to vent the trash can using some sort of filter or it will create too much back pressure and restrict the DW735 output. It should not create any vacuum in the trash can since the DW735 is blowing into the can. Got pics? The DW735 blows hard, so if you don’t have a way to secure the lid to the can, it will just pop off. I learned this the hard way. Currently I have mine hooked up to a trash can separator lid from woodcraft, which is also hooked up to my DC. So the 735 blows in to the can while the DC is sucking out of it. Works great. I used these ideas for my 735 and it works great. I had the same issue trying to control the jet stream of chips coming from that planer. The best set up I came up with was a Thien Baffle chip separator on top of a large garbage can. The blower was powerful enough to spin and separate the chips without the use of a dust collector. I also put a small bag from one of those 3/4 hp mini dust collectors on the top of the separator for the fine dust it doesn’t separate. Works great. I have a little 1 hp Jet DC hooked to mine. Only complaint is that the bag is only about 30-35 gallon. Hate stopping to empty it. Well I figured out why my hose came off. Apparently I grabbed the wrong 4 inch fitting at rocker or it was in the wrong bin. They actually make a flared fitting now that fits snugly on a metal blast gate. Gary I looked at that link. I already have the stand. So that won’t work for me. Did make me think a little harder at other options so thanks for that. 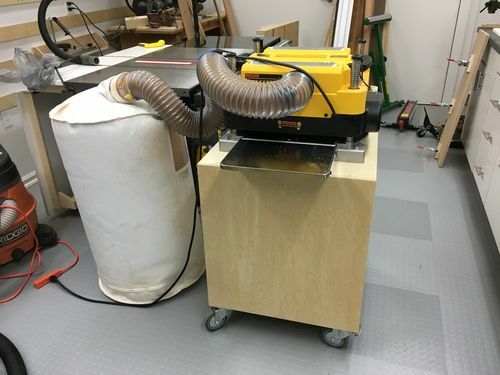 Gene, I have a bigger bag, Jet vortex cone, but between the jointer and the planer it takes no time at all to fill it up. I’ll come up with something. Didn’t want to go the the thien baffle route. Shop floor space is at a premium. Gary I looked at that link. I already have the stand. So that won t work for me. Did make me think a little harder at other options so thanks for that. Gene, I have a bigger bag, Jet vortex cone, but between the jointer and the planer it takes no time at all to fill it up. I ll come up with something. Didn t want to go the the thien baffle route. Shop floor space is at a premium. The shop DC is vented to the outside with a cyclone ahead of the impeller. Catches the chunks. But due to my lack of foresight, and laziness, hooking the planer to the shop DC is impractical. Don’t use the jointer enough to warrant a DC hookup. A big plastic tub catches the shavings. Gets emptied maybe once a month. I use a dust collector bag from Penn State. Just blow right into it. Works great.